Professor Mark Graber, MSBA President Sara Arthur, and the Honorable Robert McDonald are pictured with Franklin and Northwood students. UM Law hosted this year's competition. Before an esteemed panel of judges, Franklin High, Baltimore County, emerged as the victor over Northwood High, Montgomery County, last Saturday, November 4, 2017. 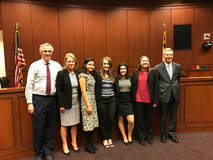 The 6th annual high school moot court competition included six teams from the state: Mergenthaler Vocational, John Carroll, Richard Montgomery, Surrattsville, Northwood and Franklin. Our heartfelt thanks to the law school students, attorneys, judges and professors who presided over the competitions throughout the day! What an exciting year this will be for our new Baltimore City Council Pages who will be working at City Hall! This will be a year of transition for our city as we welcome Mayor Catherine Pugh and 7 newly elected council members to the City Council. Our Pages will have a front row seat watching the political wheels of the community turn. Also, during their participation they will work on an Advocacy Project, which will be presented to City Council Members and Staff in April 2017. Both of our Pages are seniors at Mergenthaler Vocational High School where they are enrolled in the Law Program. Lewis Laury and Craig Minor are no strangers to the Citizenship Law Related Education Programs. We first met the young men as Freshmen who were just getting their “toes wet” learning about the legal profession through their school program. As they began to learn more, their desire to achieve more became apparent. Both Lewis and Craig have volunteered at Baltimore City Teen Court hearings; are alumni of the Baltimore City Law Links program; mentees in the BOSS mentoring program hosted by University of Maryland Francis King Carey Law School and are currently second year participants in the MSBA High School Mock Trial. Last year, Lewis and Craig along with some other classmates worked on an advocacy school project to build better relationships and communication among Baltimore City School Police and students at Mervo, in an effort to lower the rate of police contact, decrease conflict and resolve issues in a civil manner through Peer Mediation. They are proud to say that they have held several mediations involving students, teachers and police resulting in positive outcomes for both parties. This is not the last we will see of Lewis and Craig, as they are just embarking on their journey- both plan to attend college in the Fall and go onto Law School. Leslie Wright is unforgettable. If you have met her, you already know this. She has worked with CLREP since the summer of 2006, beginning as an assistant but navigating her way to Teen Court Coordinator, and now, Director of City Programs. As such, she manages Teen Court, Law Links and the City Council Page Program. In her nearly-eleven years with us, Leslie has made her mark on community members, youth, and families alike. Having more than twenty five years' experience in the nonprofit sector, Leslie understands the importance of connections. She has great knowledge of community resources, and is quick to point someone in the right direction when they don't know where to turn. She is a huge advocate for Baltimore City youth, and believes very much in second chances. We couldn't be more proud that she was acknowledged as a 2017 #InspiringVoice by Community Law in Action, and want to thank her for all she has done to strengthen our programs and our city. #YouRockLeslieWright. Our 2017 Johns Hopkins Law Links Interns have made the news! For the 5th year in a row, Johns Hopkins Health System Legal Department is supporting the Baltimore City Law Links Internship through its Summer Youth program. Daisheau Player, from Poly, Edward Bush, from Reginald F. Lewis, and Hope Brown, from Mergenthaler Vocational, are all working with various offices including Employment and Labor Affairs, Organizational Equity, and Compliance/Technology and Commercial Transactions. Click on the link above to read more about each intern!